The issue I am experiencing might fall under the oops-I-still-have-kids-in-this-age-bracket category, but regardless, I don't think in my younger parenting years I ever found this concept delightful. In our neck of the woods, families have invented a new Halloween tradition. With the addition of this sneaky custom, the tally of possible Halloween festivities has grown to a staggering, insurmountable number. Getting 'boo-ed' is a younger kid's equivalent of having clever, artsy-type high schoolers redecorate your yard in toilet paper. Some parent (with oodles of extra time and an absence of budget constraints) fills a pumpkin head trick-or-treat basket with goodies and deposits it on your doorstep. The orange container might be chock full of an array of Halloween themed items such as: coloring books, pumpkin shaped cookies cutters, spider rings, sugar cookie mix, goblin socks, frosting with pumpkin sprinkles, window clings, candy, ghost decorated paper plates, erasers, more candy, pencils, scary songs CDs, plastic candy dishes, and you guessed it - even more candy. 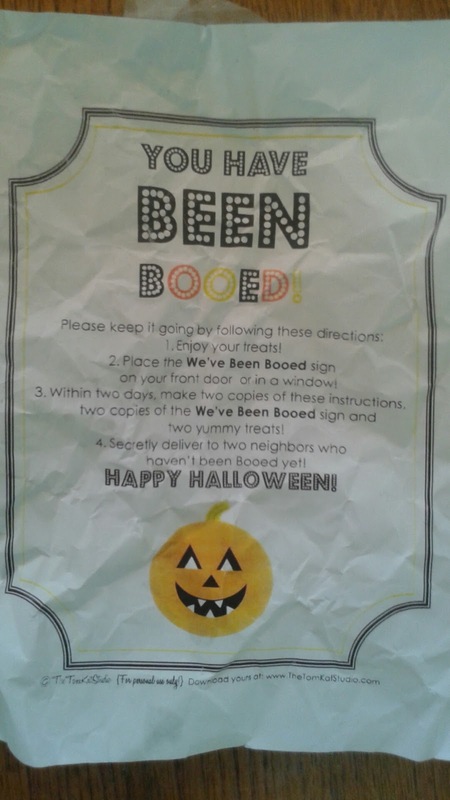 Before they ring your bell and head for the hills (or their waiting minivan), the boo-ers include a note with instructions as to what to do once you have officially been boo-ed. We encountered our first boo-ing when Laddie stood knee high to a made-from-a-bed-sheet ghost. While our kids were excited, Coach and I (translation: me, myself and I) were strapped with an extra trip to the store to stock up on boo-able goodies. Adding adventure to an already hectic holiday, I now was forced to conduct research to determine which of our friends and neighbors had yet to get boo-ed. The one page, cheery boo-manual inserted in our pumpkin head instructed us to keep the fun going. Yippee. We were also expected to proudly display this list of boo rules and regulations on our front door so we would be skipped over if another family tried to target us. If our 'gift' arrived late in October, then we struggled to identify a family in need of a good boo-ing. As if dealing with teething babies, kindergarten homework, and heavy bins of clothes as I prepared closets for fall wasn't enough back then, I got to conjure up some energy to sneak attack some other unsuspecting family. I delved deeply into one-of-a-kind, hand sewn, who-needs-a-pattern costume projects each year in order to remind myself that my talents ran deeper than loading a dishwasher, changing a diaper, and successfully flagging down our passing school bus. Although the thrill of the challenge fueled both me and my sewing machine during the month leading up to Halloween, most of those late nights and fabric strewn living room disasters are nothing but a blur now. With a storage room resembling a behind the scenes view of Jim Hensen's work space, my days of creating unbelievable costumes are a thing of the past. When the kids ponder what to wear for Halloween, I point them in the direction of the awesome inventory in the basement. Even without the distraction of sleepless babies and unfinished costumes, dealing with a recent boo-ing irritated me a tad. I admit that I shudder to think of the differences in childhood experiences Curly has in comparison to Laddie's. A decade ago when an unwanted bucket of candy and Halloween accessories landed on our doorstep, Laddie jumped up and down in celebration. I smiled in his presence and only grumbled about the latest 'let's-make-this-holiday-better scheme' behind closed door to Coach. Last week when we were boo-ed for the second time this season, I rolled my eyes. After shouting 'Not again! ', I shared some choice words with Tetanka for ripping down the necessary 'We've been boo-ed' alert paper. His transparent scheme of receiving more candy proved successful. The cuss words I spewed are words Laddie probably didn't hear until junior high. Curly, as her role as the youngest would have it, probably hears these words from me weekly. While Tetanka's mission may have been accomplished, my mom-of-the-year application is officially serving as someone's fall bonfire kindling. Poor Curly. Since my focus is fixed on more pressing issues (even more pressing than those I faced a decade ago), I failed to gather an exciting goody basket and sneak attack another house. 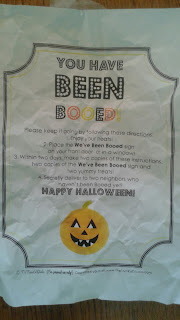 The fact that my radar failed to register that the 'no boo-ing necessary' paper was no longer posted on our front door thanks to my sugar addicted son meant that a box of Count Chocula cereal infiltrated our home during our second Halloween ding-dong-ditch incident. The cereal I would never allow anyone in our family to eat never made it to the kitchen. Tetanka dug through the bag, but I was wise to his efforts. The sugar-coated balls of gross breakfast food is hidden away until I can donate it to a food pantry, which raises a question - is it wrong to donate food that I wouldn't let my kids eat? When the kids were young, the additional load of candy arriving on our front porch could easily be stored on the fridge, monitored, and distributed in suitable portions. With teenagers in the house, the food situation is a downright free for all to begin with. Throw tons of sugar on the premises just days before the annual candy overload holiday of Halloween wreaks havoc on life as we know it, and I feel my face morphing into the kind of frightening expression masks are modeled after. The basic concept of receiving a gift and not knowing who to thank leaves me feeling awkward. Of course I also feared that our identity would be discovered and our collection of loot would be considered sub-par, which wold be embarrassing. Prior to this year, we haven't been boo-ed in a few years. Some of the items given to us back in the day were generous. It always seemed rude not to offer someone a thank you, even if the act was somewhat unwelcome. I would value the opportunity to send a thank you note to the adult who dreamed up this additional holiday activity. Before I thank the person, I would like to have a few minutes alone with her to question her motives for adding the boo-ing category to the Halloween mix. Were you bored? Did you find carving pumpkins, attending costume parties, hanging spooky home decor, visiting haunted houses, shopping for costumes, and volunteering for children's classroom parties an insufficient way to celebrate? Next I will want to know if she is the same person who blew up birthday parties. Is she responsible for graduating children's birthday parties form the at-home, low-key celebrations to the expensive, overdone, must-have variety that kids crave and parents continually agree to? Did she set the standard that kids toss these monstrosities annually for over a decade? Lastly, but certainly of equal importance, was she the one who first collected junky, dime-store, choking hazard items and mixed them into bags brimming over with bubble gum and Laffy Taffy to distribute to children - most of whom were only vaguely acquainted with her child -at her kid's birthday extravaganza? Has to be the same person, right?